What a day we had today! Our family and so many of our wonderful friends and neighbors celebrated Emily's 5th birthday. We did a Hello Kitty party, so of course I went a little nuts with the Hello Kitty cartridges. So here's just a couple of pics of a few things from her party. 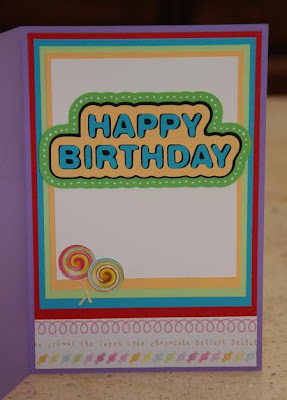 I made her this card late last night. It's like a little Sweet Fairy, and it's from the HK Font cart. 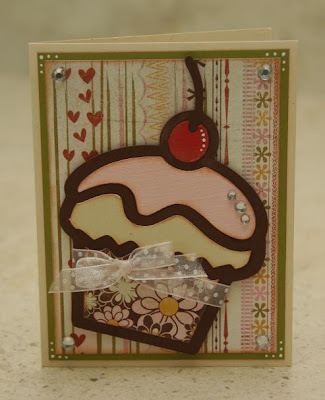 The cherries and strawberry are from HK Greetings, as well as the inside "Happy Birthday". 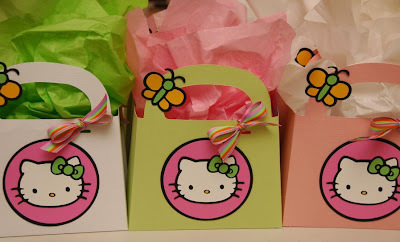 Then a little close-up of the goody bags I made from HK Greetings and Tags, Bags, Boxes and More cart. 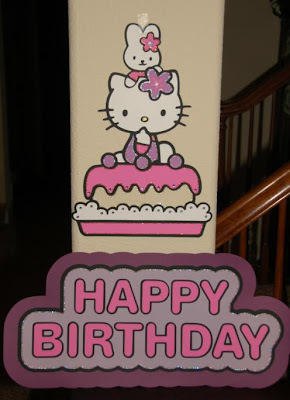 Then I used a 12x24 mat and some paper of the same size to create a couple of large wall-hangings for the party. 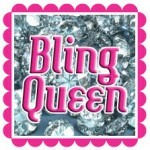 I blinged them up with Stickles and rhinestones, and Emily LOVED them! Finally, that's my sweet girl in the HK shirt I made for her. 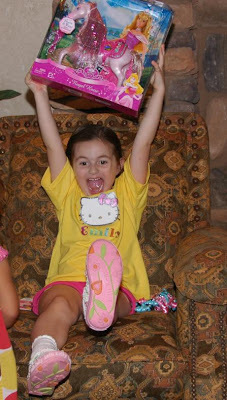 She was so funny and animated opening her presents. She had a great day, and I sure did too! 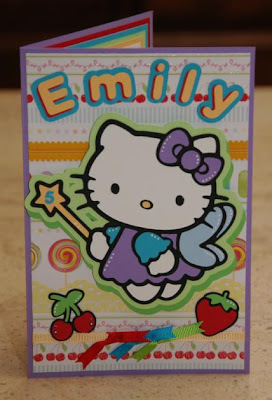 Happy Birthday, Emily! Can you believe it's almost September? And that means school is starting, fall is right around the corner, and party season is about to begin! This layout would be perfect for many occasions - a romantic night out on the town, a Halloween costume party, the family all dressed up in their Christmas best, New Year's Eve party, prom or wedding pictures, the list goes on. 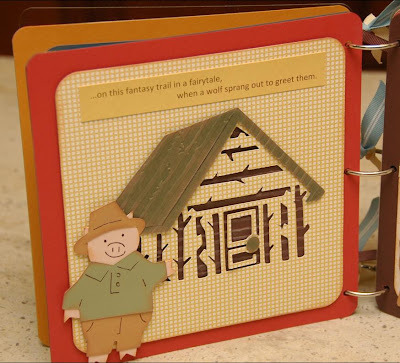 This layout was created entirely with the Home Decor solutions cartridge, which is a chic and very versatile cartridge. 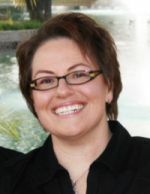 This class will be held Thursday, September 17th at 6pm, here at my home in Rocklin. 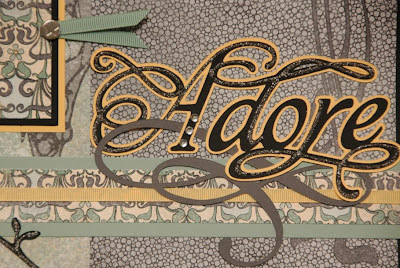 Class fee is $25, which includes all materials - patterned papers, cardstock, ribbon, silver hardware, and even rhinestones and Stickles! Kits are also available, and I'm happy to ship if needed. If you'd like to sign up for the class or a kit, you can email me at moniquegriffith@yahoo.com or leave a comment here with your email address so I can get back to you. 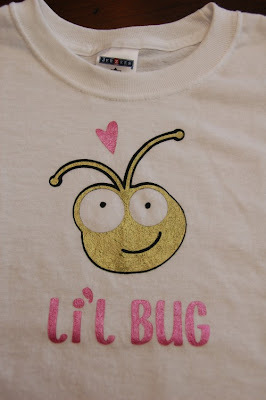 Just wanted to share a couple of t-shirts that I decorated for my daughter, Emily. I used vinyl in the Cricut to create stencils, and then painted with fabric paint. These were a little complex because of the different layers, but I learned a lot. Honestly, making t-shirts could be really, really addictive! For you locals, I'll be teaching a t-shirt class on October 22nd, with simplified but still cute designs. Btw, on the white t-shirt, the Cricut bughead was from the Storefront cartridge and the font is Don Juan. 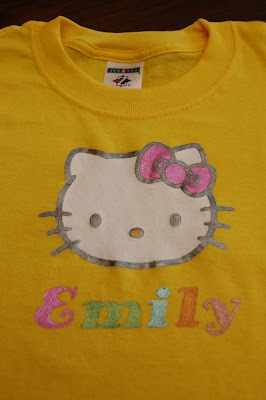 The yellow t-shirt design was from Hello Kitty Greetings of course, and the font is from the Hello Kitty Font cart. 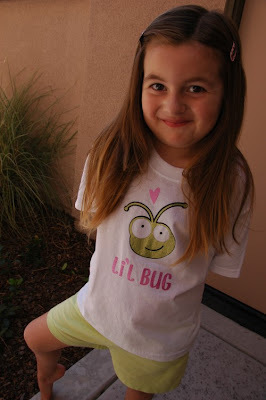 And that's my sweet girl who got to wear her shirt for a big crop night here on Friday. She'll get to wear the HK shirt to her 5th birthday party this coming weekend. Can you believe that this project has been floating around in my head for about a year??? 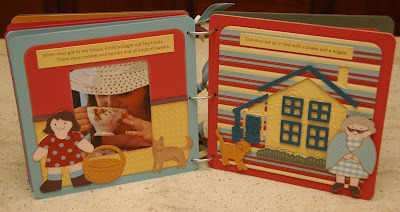 What I can't believe is that I've finally been able to make it - and I'm thrilled with how it's turned out! This is made entirely with the My Community cartridge (and a cut or two with a font cartridge as well). 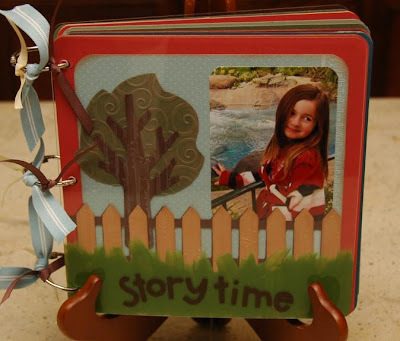 It's an 8x8 personalized fairytale storybook with acrylic covers, which holds several pictures and includes an original story by the very talented Susan Rees (my Mom, who is a gifted writer!). 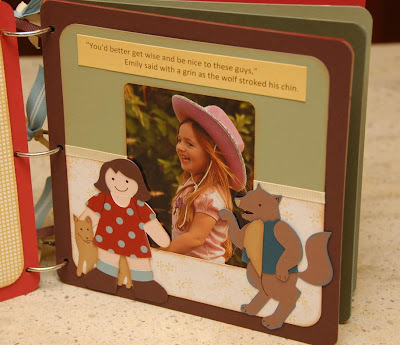 When you take the class, you tell me the name of your child, and I plug it into the story to make your child the main character, who then meets up with the Three Little Pigs, the Big Bad Wolf, Little Red Riding Hood and Grandma on a fun adventure. By the way, you can substitute out the girl main character for a boy if need be. Be sure to check out the posts below for more pictures - there are 12 pics total! This project was designed for a class, which will be held Saturday, September 12th at 1pm here at my home in Rocklin. It will likely go until 8 or 9pm, so it is a marathon class! The class fee is $35, which includes materials. 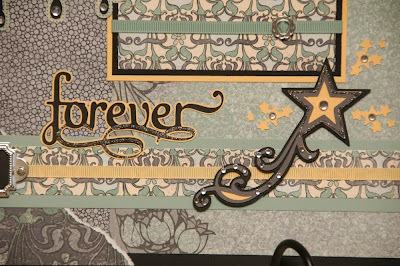 You will need the Expression machine, My Community cartridge, and a few little extras like chalk inks and pop dots. 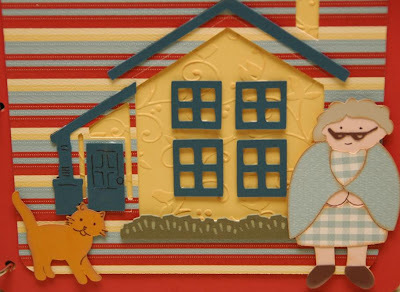 I have a very limited number of kits (about 35) since this is made with several retired papers and supplies. So I'm going to reserve 25 of the kits for local people who can actually attend the class since it's obviously quite involved. The other 10 kits will be available to my long-distance clients, and then we'll start a waiting list after those 10 are gone. That way if the class doesn't fill up, then the kits can be shipped to those on the waiting list. Hope that makes sense! (Shipping cost will be a flat $10.35 in the US.) 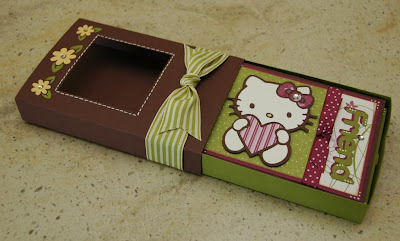 If you do order a kit to be shipped, please be aware that in addition to the items listed above, you'll also need a strong corner rounder that can go through chipboard, a Cuttlebug with embossing folder, soft green acrylic paint and a paintbrush (for the grass on the front acrylic cover). 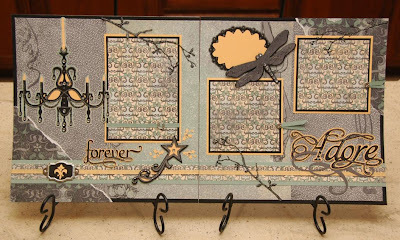 If you are intersted in signing up for this class, or ordering a kit (which will be shipped out September 14th), you may contact me at moniquegriffith@yahoo.com or leave a comment here with your email address and I'll get back to you. More pages to check out. These are some of my favorites, actually. I'm hoping you can see the brick texture in this first picture. The red underneath layer was Cuttlebugged, the mid white cloud layer was popped up, and then the upper-most blue roof layer was popped up even higher. 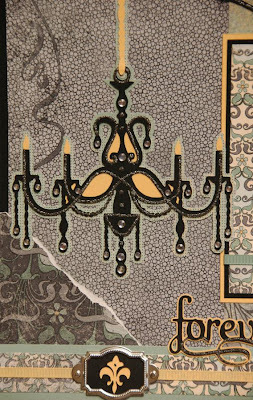 So there are a lot of textures and depths like this throughout the book. And how can you not love this Little Red Riding Hood? It just takes me back to childhood somehow. But I'm not sure - I think Grandma might be even cuter! Here are the last couple of pages. (Yes, that's Emily dancing around like a crazed rock star.) There is a place to write who the book is for, and who made it. Plus several lines to write what you love about the child - a little dedication/journal area, really. 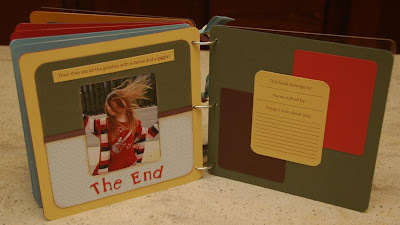 The very back page is perfect for a simple photo, and then it's got an acrylic back cover. Thanks for looking through all of these photos - it was too hard to narrow them down! Now here is the entire story - with Emily's name plugged in, of course! 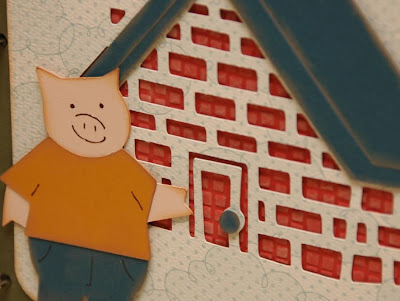 Emily so sweet happened to meet three little pigs on a journey. when a wolf sprang out to greet them. "You'd better get wise and be nice to these guys,"
Emily said with a grin as the wolf stroked his chin. What's that up ahead? Are we seeing red? 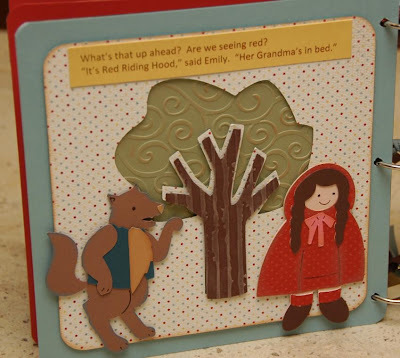 "It's Red Riding Hood," said Emily. "Her Grandma's in bed." 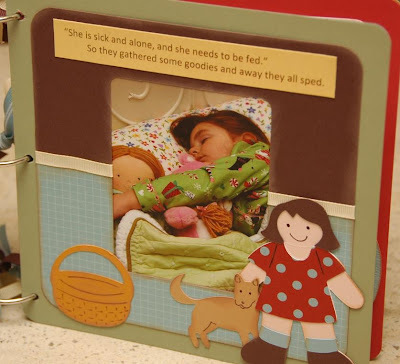 "She is sick and alone, and she needs to be fed." So they gathered some goodies and away they all sped. When they got to her house, Emily brought out the treats. There were cookies and berries and all kinds of sweets. Grandma sat up in bed with a shake and a wiggle. Then they ate all the goodies with a dance and a giggle! 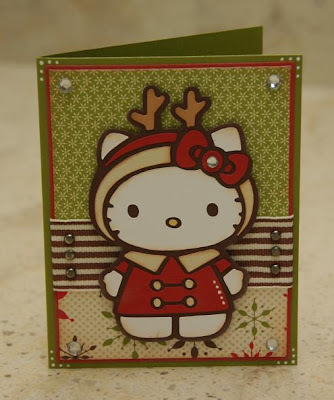 It's Hello Kitty time! 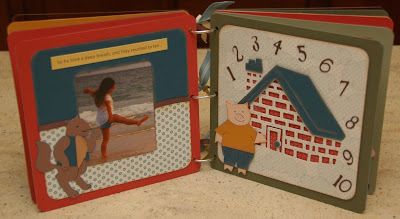 This is my latest project for a class, which will be held Thursday, September 3rd at 6pm here at my home in Rocklin. 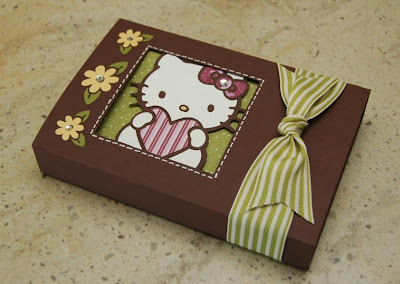 This project uses the Hello Kitty Greetings cartridge - can you say "CUTE"?!?!? 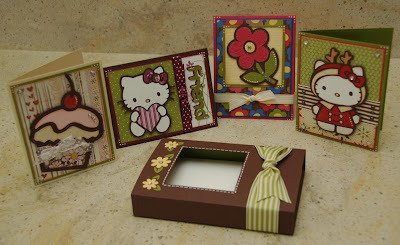 You'll get to make 4 different Hello Kitty greeting cards, and this fun little gift box to store them in. 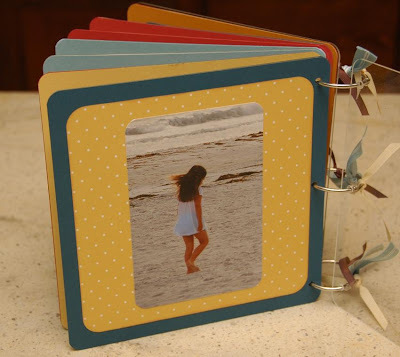 This would make a great gift for a teacher, mom, sister or friend. Or you can just hoard them all for yourself - I won't tell! (Fyi: The box is not from the HK cart. It's from Tags, Bags, Boxes and More, but I will have them pre-cut for you.) 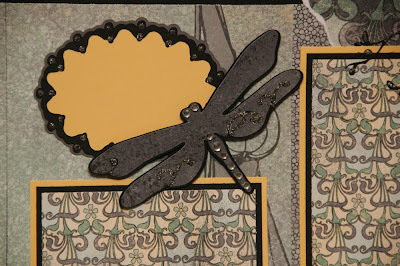 If you're interested in the class or a kit (and yes, I can ship), please contact me at moniquegriffith@yahoo.com or by leaving a comment here with your email address so I can get in touch with you. 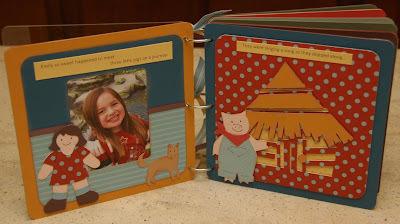 Class fee is $25, which includes all materials and detailed directions with Cricut Cut Chart and plenty of color photographs. Have a happy day! !